푸켓, 태국의 라마이 게스트하우스 | 호스텔월드에서 예약하세요. 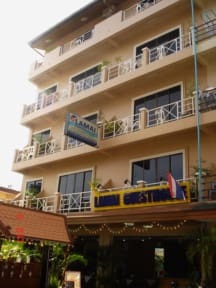 Lamai Guesthouse has 26 rooms with air-condition, fan, hot shower, private bathroom, balcony, TV, DVD player, refrigerator, mini bar, beach towels,hair dryer, safety deposit boxes, and Wi-Fi connection in all guestrooms for free. Lamai Guesthouse has total 26 rooms with 3 types of room. There are 18 Deluxe rooms, 4 Superior rooms, and 4 Standard rooms. Deluxe room is size 25 s.q.m., with Double bed. (A king size bed, 6.0 feet), a set of PC computer with internet, Wi-Fi, and printer for free using. Superior room is size 25 s.q.m., with Twin bed (2 small beds, 3.5 feet each), a set of PC computer with internet, Wi-Fi, and printer for free using. Standard room is size 15 s.q.m., with Single bed. (A small bed, 3.5 feet, for 1 person only), and Wi-Fi connection for free. All room rates are not included breakfast. Lamai Guesthouse serve 24 hours for the security camera recorder at the lobby, and the security key card door in all guestrooms. Our bar and restaurant serve 24 hours. Our restaurant serve American breakfast, Europian food, Italian food, and Thai food. Our reception counter serve 24 hours. Our maid service is between 8.00 a.m. - 5.00 p.m., everyday. Check-out time is at 12.00 p.m. (at noon), and Check-in time is at 2.00 p.m.
We have the motobike for rent for THB.200 per day. There are Suzuki, Yamaha, and Honda moterbikes. It is so good when you are riding the motorbike to go around Phuket!!! Laundry service, motorbike rental, jeep or car rental, telephone, fax, tour information, and Taxi car service. Lamai Guesthouse is near Patong-Karon Moutain. So, it is so beautiful, quiet, and very freshy!!! !